Tala can read all by herself! 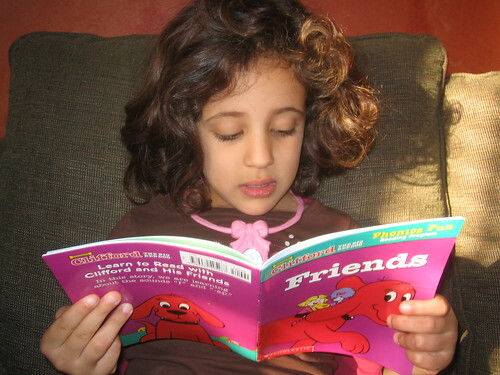 She is reading Clifford's Phonics Fun Pack #1 and is almost done with the 12 books in the pack. I hardly have to intervene or correct her. She is doing great sounding the letters and the words. Like everything with Tala, it happened all of a sudden على غفلة! She is an observer. We don't witness her trying things or learning her way to doing them. She would observe and then decide to do whatever it is when she feels she's ready. And it all takes us by surprise to realize that she can! I remember we did speech therapy with her when she was almost 2, because she was silent. Few months after she started, it was like somebody pushed her "Talk" button. The therapist was amazed as much as we were. Tala knew how to talk, but she didn't try it out. Once she started, there was no stopping her... Up to this day! Tala is so proud of herself--rightfully so. When we went shopping yesterday, she told every cashier and person she had the chance to talk to, "I can read!" For some reason, I thought we were late in starting Tala to read. I thought that Moody started reading at an earlier age. Moody learned reading using the same Clifford Phonics Packs. And actually, he read his first book by himself on March 7, 2006. He was 5 years and 9 months. 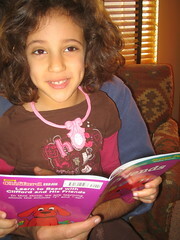 Tala was a week short of 5 years and 3 months when she read her first book. Way to go, Tala. I am a very proud Mama! On the nanny front. We found a nanny that started on Monday. Her name is Jeanne (pronounced like genie of the magical lamp). It looks like we found our magical nanny. I told Moody that she made our (mine and Sol's) wish come true of finding the perfect nanny for them. Moody had to take her down the power-struggle lane. He likes her a lot, but he does not like the fact that she has rules, lots of them. He tried to gain some ground on her, but was unsuccessful. I really hope it works out. She is coming to watch the kids today so Sol and I could go to a fun gathering. Her birthday was yesterday, the kids are ready with a cake and candles to celebrate with her! Parents go through the same experience as you did with one particular child. At the end everything went well. Visits to local library are great for kids,watching programs such as Arthur & Cyberchase. This a nice movie for kids, they will enjoy it. no, i'm so glad to know that u could read bye your self honey.. may god bless you and your perents..
ربي يحفظهالك يا خالي..وتكبر وتكون كيف أمها هنو..
Hey habooba heba! Thanks for stopping by. Long time no talk... sorry about that! Tariq, I don't believe you are any of the Tariq's I know, right? PBS Kids is he only channel the kids watch in the TV-allowed time. And Arthur and Cyberchase are the hits. We have to go to that movie! Thanks for mentioning it.